This sac spider is about 6 mm in length. Photographed at a commercial nursery in Phoenix, Arizona, USA. November 2011. After I found that this spider had hitched a ride home with me upon cut plant specimens I placed it alone in a clear plastic Petri dish. In less than five minutes it had spun itself a new silken tent in a corner and was busy zipping itself inside. When on vegetation sac spiders remain inside their tents, often constructed between appressed or curled leaves, all during the day light hours. Only at night do they emerge to hunt insect prey. They do not spin a snare web, but rather hunt by ranging over the plant surfaces. Specialized body and leg hairs allow them exquisite ability to detect vibrations caused by moving insects. 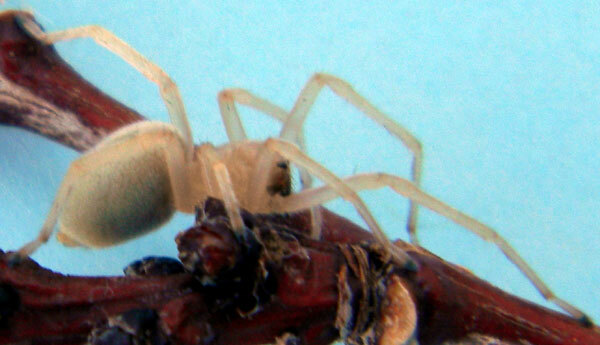 The bite of sac spiders is thought to be mildly toxic, but to what extent is not known. With the onset of cold temperatures these spiders will sometimes enter homes looking for warmth. In the garden, Long-legged Sac Spiders should bew thought of as friend because they prey on plant-feeding insects and may keep their populations in check.